Gold and Silver Indices (GSI) compares the movement of physical gold and silver in India vis-a-vis the Nifty. The price of physical gold and silver in India is not only dependent upon international prices but also on the Indian Rupee. The London Fix is the most popular indicator of gold and silver prices in the international markets. Similarly, The Reserve Bank of India's (RBI) daily reference rate for the INR is the benchmark for rupee dealings. Hence, the GSI uses these reference rates to calculate the indices. 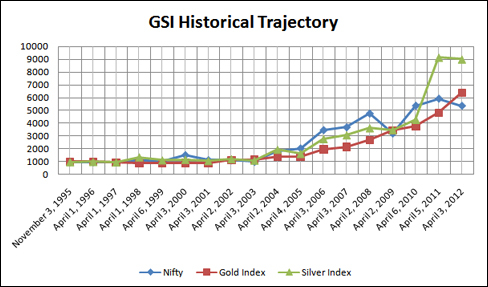 The GSI helps people make a valid and an approximate comparison between the returns given by Gold, Silver and Nifty by recording their individual trajectories. The GSI data is maintained by Finkurve Bullion Private Limited (FBPL). To make a valid comparison between the two entities, Nifty and Gold Fix are required to be brought on a common base of 1000. To make a valid comparison between the two entities, Nifty and Silver Fix are required to be brought on a common base of 1000. 1. Government taxes and other duties have not been considered while determining the indices. 2. INR Reference Rate and Gold AM Fix/Silver Fix data is released by the concerned authorities at different timings. So, it might affect the accuracy of the indices to an extent. 3. The days on which there is no Gold AM Fix or Silver Fix or INR Reference rate or S & P CNX Nifty data published by the concerned authorities, the Indices will not be calculated. 1.The Gold Index and Silver Index data provides indicative returns of physical gold and silver vis-a-vis S & P CNX Nifty. 2. S & P CNX Nifty belongs to the National Stock Exchange of India Limited (NSE) while the Gold Index and Silver Index belong to Finkurve Bullion Private Limited (FBPL). The comparison of performance of Nifty vis-a-vis physical gold/silver in India may not be valid or justified. 3. The Gold Index and Silver Index data shall not be construed as an investment advice or benchmark for reference. What is Gold AM Fix? The London gold fixing or gold fix is the procedure by which the price of gold is determined twice each business day on the London market. It is designed to fix a price for settling contracts between members of the London bullion market, but informally the gold fixing provides a recognized rate that is used as a benchmark for pricing the majority of gold products and derivatives throughout the world's markets. The gold fix is conducted daily at 10.30am and 3pm, London time. The London silver fixing or silver fix is the procedure by which the price of silver is determined once each business day on the London market. It is designed to fix a price for settling contracts between members of the London bullion market, but informally the silver fixing provides a recognized rate that is used as a benchmark for pricing the majority of silver products and derivatives throughout the world's markets. The silver fix is conducted daily at 12pm, London time. What is S & P CNX Nifty? The S & P CNX Nifty, also called the Nifty 50 or simply the Nifty, is a stock market index, and one of several leading indices for large companies which are listed on National Stock Exchange of India. What is INR reference rate? The Reserve Bank of India compiles on a daily basis and publishes reference rates for Spot USD/INR and Spot EUR/INR. The rates are arrived at by averaging the mean of the bid / offer rates polled from a few select banks around 12 noon every week day (excluding Saturdays). The Reserve Bank of India (RBI) is the central banking institution of India and controls the monetary policy of the Indian rupee as well as US$302.1 billion of currency reserves (as of 2011). How can you compare Nifty with GSI? Can I trade the GSI? No, it is only for reference and indication of how the gold/silver prices are doing as compared to the stock markets.